For a recent picnic we hosted, my friend Howard prepared this dish. It's one of my favorite summertime salads and I never posted it here before because it was just so easy and effortless. It's true - the simplest of recipes usually are the best and this one is no exception. If you wanted to kick it up a notch, add some fresh strawberries - it's equally delicious too! Another suggestion is to toss in chopped prosciutto for a little more savory notes. And if you don't have any peaches, nectarines work just as well. 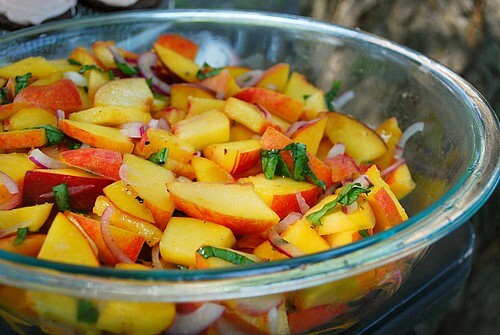 Toss peaches with red onion, basil, lemon juice, salt, and some pepper. Drizzle with olive oil and serve. Summer is not done yet!!! Looks delicious, juicy and healthy! Sorry you didn't like it Anonymous... I especially like this salad if the peaches are sweet and ripe!